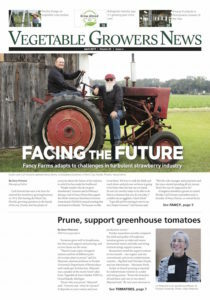 California's strawberry industry has almost completely phased out its use of methyl bromide as a pre-plant soil fumigant, and the importance of breeding for disease resistance has never been greater, according to Mike Nelson of Plant Sciences, an ag research company based in Watsonville, California. Nelson spoke during the North American Strawberry Growers Association's (NASGA) Annual Conference in Ventura, California. He said alternative fumigation practices – including combinations or sequential applications of chloropicrin, 1,3-dichloropropene and metam sodium – were implemented successfully during the initial years of the methyl bromide phaseout. Recently, however, the alternative mehods have struggled with the emergence of new soilborne fungal pathogens like Fusarium oxysporum and Macrophomina phaseolina. So, when developing commercial strawberry cultivars, an emphasis must be placed on screening germplasm against lethal and sub-lethal pathogens and incorporating disease resistance genes via multi-trait selection systems, Nelson said. Read more about strawberry breeding in future issues of VGN and FGN.